Come experience our NEWLY RENOVATED hotel as of June 2016. 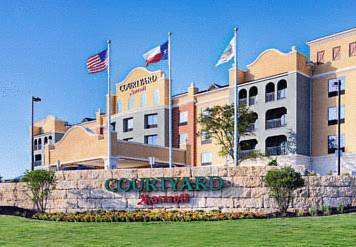 Perfect for both business and leisure travelers, the recently renovated Courtyard Marriott SeaWorld/Westover Hills features a variety of unique amenities combined with an exceptional location. Situated less than 2 miles from the SeaWorld/Aquatica Adventure Park, we are proud to be a Shamu Approved Hotel . We are also proud to be close to the many Westover Hills corporate campuses. This resort hotel boasts an upscale atmosphere and a convenient shuttle service to nearby locations, including SeaWorld, Wells Fargo,Nationwide, and the shops & restaurants of Alamo Ranch. Our Courtyard offers exceptional business class accommodations with a well-lit work desk, ergonomic chair, and complimentary Internet access. Relax in our unique heated indoor/outdoor swimming pools and hot tubs, where you can swim right up to our Waves Pool Bar for refreshment, while still keeping cool in the pool! Your food and beverage destination for refreshing breakfast, lunch, and dinner choices, and a variety of cocktail options in the evening. The Bistro also offers room service and specialty beverages made with Starbucks coffee.